As I'm getting ready to move into my new home, I'm gathering lots of cute bits and came across Chic Chic Beauty while I was on the look out for shabby chic curtain ties which seem to be few and far between. Justine from Chic Chic Beauty kindly sent me a wooden heart garland to review on here as well as the curtain ties so let's have a little look at everything! So here they are! Both items are wooden, and they're nice and sturdy. The wood is painted white and decorated with gold detailing and floral decoupage. The decoupage has been done seamlessly, it's very neat so the design looks painted on! The curtain ties are as beautiful as I expected and they will add a nice little touch to my living room. The garland is also beautiful, the twine gives it a very rustic vibe which is cute. My items from Chic Chic Beauty are absolutely lovely! 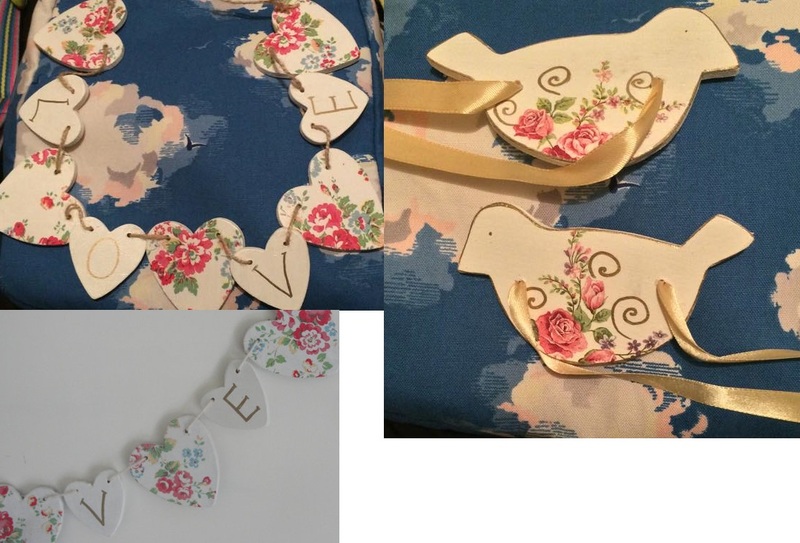 They have been decorated so neatly with really cute designs, I can't wait to display them in my new home!